Though probably most widely known for his famous ballets Gayane and Spartacus, Khachaturian is also celebrated for his series of concertos—indeed the Piano Concerto (1936) and Violin Concerto (1940) have become part of the standard 20th-century repertoire. 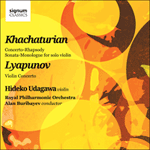 While those works are in the standard three movements, in the early 1960s Khachaturian composed a series of one-movement concertos—or ‘concerto-rhapsodies’, as he called them—one each for violin, cello and piano. The first of these was the Concerto-Rhapsody in B flat minor for violin and orchestra composed in 1961–62; in its single-movement arch and episodic form, not to mention its underlying romanticism, it is not impossibly distant, stylistically, from Lyapunov’s concerto. Khachaturian composed the work for the violinist Leonid Kogan, who gave the premiere on 3 November 1962 with the Moscow Philharmonic Orchestra conducted by Kiril Kondrashin. By this stage of his career Khachaturian’s music was less concerned with Armenian intonation and colouring, or with the aggressive rhythms of his earlier music, and his orchestration had become more impressionistic. The Concerto-Rhapsody combines the various appearances of a principal theme, which haunts the work despite many side episodes, with an overall two-part, fast-slow form distantly reminiscent of the rhapsodies of Liszt, Bartók and Enescu. It is so inventive, within its smaller compass, that it is probably a finer work than the better-known 1940 Violin Concerto, a work in which repetition tends to steer near to redundancy. The Concerto-Rhapsody opens in lamenting mood, with imploring music for strings and brass set against a mysterious ostinato and creating a tense, uneasy atmosphere. Flute and harp lead to the entry of the soloist, with an elaborate cadenza-like monologue which leads to a rhapsodic statement and elaboration of the main theme over pulsating wind chords. The music becomes more animated and the solo part ever more decorative, assuming an increasingly folk-like character, before reaching an eloquently soulful version of the main theme that marks the mid-point of the piece and the lyrical high point so far. Despite its kaleidoscopic changes of colour, the music is somehow hypnotic in its gradual building-up of tension. Robustly fiddling, gypsy-style music for the soloist opens the work’s livelier and more brilliant second half, in which Khachaturian’s typically aggressive rhythmic writing for brass and percussion makes itself felt. The headlong vigour of the music slows for a time as the opening theme returns, opening up a vein of soulful passion for soloist and orchestra, as do other, haunting elements from the work’s opening moments. But evocations of folk-dance provoke the biggest climax so far, and the outcome is a fiery and virtuosic closing section that drives to an exhilaratingly decisive close.